This document will assist you with the removal of students that have left the school, updating current students and adding new students. The first step is to deactivate all students. The default setting (Deactivate students who currently belong to Any voting group) is your best option for doing this. In step 2 you will activate any students who are returning to your school. In this next step you will need a file of all students on your school campus. 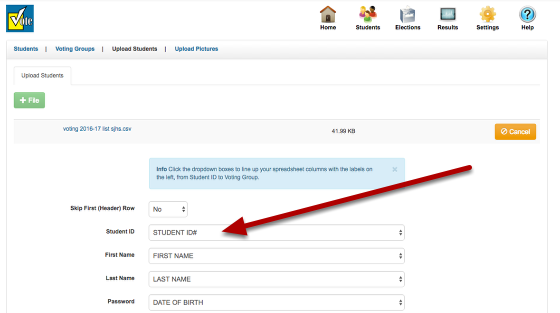 If you need more details on uploading students you can use this help document on how to upload students. Be sure when you upload your file that you map the fields by choosing the correct dropdown option. If you are using birthdays, we recommend that you check the box "Passwords are Dates". This will automatically format any date into the format of m/d/yyyy (example 2/5/1997). Finally go to the students section and verify that your students were uploaded correctly. Look at the headers of each column and verify that the correct information is listed. We also recommend that you logout and try logging in as a student to verify that your ID and passwords were correctly uploaded.